» XFCE stays in the homesickness? XFCE stays in the homesickness? While other desktops such as Mate, Gnome or KDE are fed by GTK+4, the Xfce desktop keeps its GTK+2. Re: XFCE stays in the homesickness? Current stable Xfce is still mostly based on GTK2, development Xfce is all GTK3 and many distros are shipping these components (Manjaro, Xubuntu, etc). Not sure what you mean by "fed by GTK4", but I believe only development Gnome is built around the new GTK4 libraries. Mate is still built with gtk3 libraries. KDE is based on QT. Sorry, I didn't realize that. of gnome which have nothing to do with gnome. Never forget the technology has evolved over the years and the old technology is outdated. You've missed the whole point. Never forget "Rome didn't get built in a day". retort me avail you nothing. 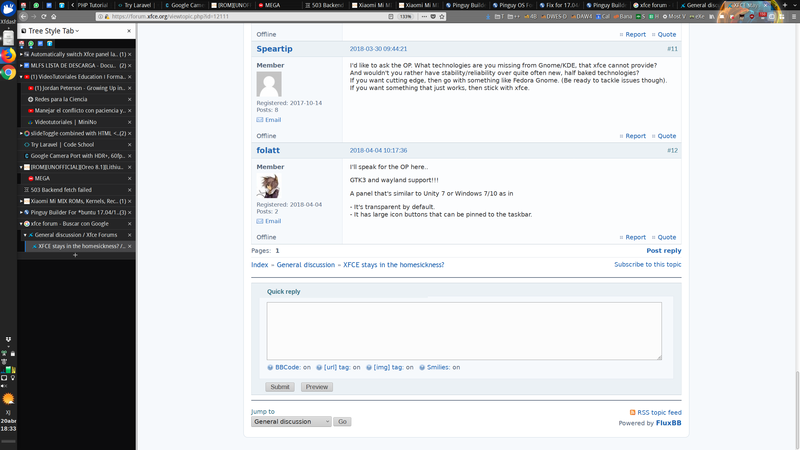 & tried to force Xfce developers to skip the growth process from 1 2 3 4 by jump 2 to 4 instead. Did you think Xfce developers are that stupid ignorant stick to old tech? Did you think Xfce developers can build 4.14 with gtk4 within months? Xfce developers are not superman. You speak like it's easy & taking Xfce developers too lightly. "Growing slowly" vs "Homesick+stubborn to old tech" they're different thing. Don't tell me you can't exact the difference between these? Never forget "Rome didn't get built in a day". And it took SIX days to burn (the majority of it). I'm the kind of person who questions whether or not "old" technology is actually "outdated" in the first place. Especially where computer software is concerned. If it did a thing - and did it well - when it was released... One assumes that it is still capable of doing that thing, to the same degree that it always could. With computer hardware, I can more easily see the person's opinion/position. On the other hand, I've read that the computer hardware inside Apollo 11 would be "put to shame" by that within the average "smart" phone of today - yet it still carried people to our moon (and back), ~238,000 miles away, across inhospitable (for all practical purposes) vacuum. And that's a thing that I have yet to see duplicated by a cell phone. Or from any technology generations newer than that which the Apollo program used. If all that "vastly outdated" technology, hardware, software, et cetera that made up the Apollo program were still in functional existence TODAY... We could, once again, send people to Luna. In regards to Xfce, the only real usability complaints I had pretty much evaporated with version 4.10. There was a thing... I do not recall what it was, only that I griped about it, and two weeks or so later, one of the developers announced that he had "cherry-picked" a few things and fixed/improved them. One was whatever it was that I was annoyed about (pure coincidence, maybe - but I felt pretty good about it, and found myself with an excess of goodwill towards the developers at that point). Others may have felt the same way about Xfce 4.8, for all I know (although I seem to remember that one as being just a bit "rough" in places). But, for me, version 4.10 was the point at which Xfce really shined. Newer versions... The improvements seem more like polishing a thing than building it, if that makes any sense. As not every improvement is guaranteed to be such, when it comes to computer software, I would not be all that disappointed if the Xfce development team were to announce the completion of their Xfce project (as long as they still maintained it, IOW, attended to newly discovered bugs). I seem to have lost that "give me more, more, MORE, enough is never enough" characteristic that a lot of people (and not all of them prepubescent children ) seem to have. If I ever actually had it in the first place. Again, my version of Xfce seems fine, to me. It appears to do everything that I require a DE to do (and which some of them still seem to have trouble with); that is, to facilitate my using the computer to do things without "jumping up and down, shouting, 'Look at ME!!!' " and distracting me from the things I wish to do. IF, OtOH, this is not the case for YOU... Perhaps it would be better to mention the specific things that it fails to do. Asking for a specific thing, or even complaining about a specific thing, if one accompanies that complaint with reasoning can often cause a beneficial change. General complaints not backed up by reasoning (or even reasons)... is often seen as a nonproductive activity, and may actually engender feelings of ill will from the very people who could help you. Honestly I wouldn't care if Xfce is homesick, is there something bad about being the 'old' distro? I'm a distro hopper, while I always come home to Manjaro Xfce, I've played with a lot of distros over the last year or so, and Xfce is always my home. It's stable, reliable, serves my needs and does it well. It's everything I need. Sure, there's undoubtedly better more cutting edge distros out there, neat new technology, but do I need it? Not really, I'm a very basic home user, I basically need an appliance, and Xfce provides that. Let someone else provide the bleeding edge, I'm rather happy not getting cut. That's what's exactly what I tried to tell op all along. only our differences is I'm not on Manjaro. Xfce devs homesick <<<was op's idea, not mine. They're just slow development like tortoise. in the end they'll go gtk3, gtk4 anyway. I won't expect tortoise to race on land with rabbits like gnome, KDE except water. No matter how heavy criticism I've. I never insult them homesick old tech, nutshell like op did. I may be wrong, but I think that maybe referring to "op" might actually mean "original poster," not the name "op" itself. I'd like to ask the OP. What technologies are you missing from Gnome/KDE, that xfce cannot provide? And wouldn't you rather have stability/reliability over quite often new, half baked technologies? If you want cutting edge, then go with something like Fedora Gnome. (Be ready to tackle issues though). If you want something that just works, then stick with xfce. I'll speak for the OP here..
- It's transparent by default. - It has large icon buttons that can be pinned to the taskbar. Do you know dockbarx? It's quite similar to Window panel where you can pin apps, etc. I'm attaching a screenshot of my PC. I think XFCE is just a perfect DE to customize the way you want it. Even with Plasma I can't get what I get from XFCE panels and "stable" plugins. There is no "system load monitor" with all the options I need, there is not any good weather plugin. XFCE is really fast, stable and has everything I need. I can't say any of this from any other DE. Your font rendering is perfect.